The choice between a freestanding or integrated model is one of the first decisions that you are going to make when you start looking for a new dishwasher. In fact, the design of your kitchen may have already made the decision for you. 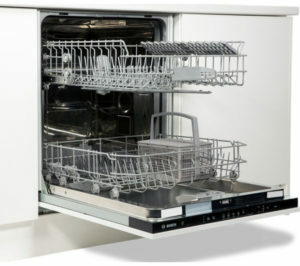 In general, the decision to buy an integrated dishwasher will have very little to do with functionality or performance. It is more of an aesthetic choice. With the appliance fitting into a space in the cabinets and being hidden behind a matching panel, it gives the kitchen a more finished look. 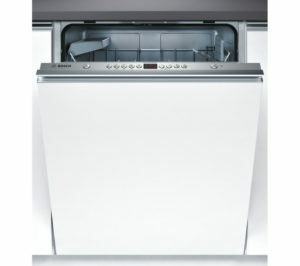 Some people prefer not to have their appliances out on display, so for them, an integrated dishwasher is the way to go. If you are looking for an integrated (also known as a built-in) machine, you have numerous models to choose from, and most manufacturers will make at least a few integrated models. That said, Bosch is one of the top brands for appliances, and their integrated appliances are some of the best available. Bosch is the preferred brand of many appliance buyers because the name speaks to quality. Bosch dishwashers are known for being reliable appliances that perform well for many years. For the most part, their appliances are well-engineered, built from quality materials and they tend to outperform most of their competitors in a number of ways. Add in the fact that their machines often come with some of the most advanced features, and it is easy to see why this is the favourite brand of so many. Bosch makes a number of different integrated dishwashers and some of them are among the best models on the current market. They have a variety of machines that offer different features and programs, different racking options and they have models that come ready to fit buyers with different budgets. In this post, we are going to be looking at our picks for the best Bosch integrated dishwashers. However, acknowledging the fact that there is more to getting the right dishwasher than picking an integrated machine from a high-quality brand, we would like to take a look at some of the other points that you may need to consider. If you are reading this, then you are probably already a fan of Bosch appliances, and you probably already know that an built-in dishwasher is the right choice for your kitchen. Those two points can be a good start to finding the right machine, but there is more to consider. In this section, we are going to look at some of the most important points that should help a buyer to find a dishwasher that will serve them well. If you want to take a closer look at some of these points, or consider some additional factors, it might help to look at our dishwasher buying guide. In addition to that, we also have a guide to dishwasher features that you may find useful. And of course you can read all our integrated dishwasher reviews here. 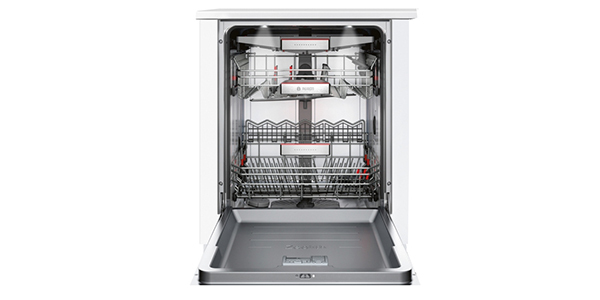 With the right programs and features, a dishwasher can offer the user a great number of options. Bosch is a brand that is known for some of their great features. With Bosch, you can look for things like their VarioSpeed time saver, sensor washing, sanitizing wash, the AquaMix glass protection, Bosch’s ActiveWater technology and more. The exact features that you get will depend on the specific model and the series from which it comes, so you do need to make sure to look for the features and programs that you like. Capacity is another point that most shoppers will consider early on. In this post, we are covering full-sized dishwashers, so you are looking at machines that should work well for your average family. However, if your dishwashing needs are a little lighter, you could consider the possibility of a slimline model. Bosch dishwashers are also known for having flexible interiors and racks that are designed for versatility and easy loading. Depending on the machine, you can find racking features like a third level cutlery tray, height-adjustable top basket, special foldaway racks and folding tines. The rack options will vary depending on the model, but most of the models from Bosch do score well for interior versatility. While the racks are one point to consider for ease of use, you also need to consider things like the design of the controls. With Bosch built in dishwashers, most machines have electronic push button controls, but some of the more advanced models will have touch controls. As an additional feature to look for, Bosch also has features like the info light. With some models, it is just a light that shines on the floor to let the user know that the machine is still running, and with others, the machine will project a countdown timer and other info on the floor. If you want a high quality integrated dishwasher that comes with some of the most advanced features, you will find it hard to do much better than the Bosch Serie 8 SMV88TX26E. While some buyers may find the high price to be prohibitive, this machine comes loaded with a great selection of programs and features, it performs well and it has Bosch’s home connect system, meaning that you can control and monitor the appliance from your Smartphone or tablet. With its 8 programs and a variety of useful features, the SMV88TX26E is one of the best cleaning machines that you will find. It has sensor washing with three automatic programs: one is a cold wash for delicates, one is normal and the third is an auto intensive. In addition to that, you also have a pre-rinse, eco wash, a night program, super and a quick wash. For the added features, the user has options like VarioSpeed, hygiene, intensive zone, half load and remote start through the Smartphone app. 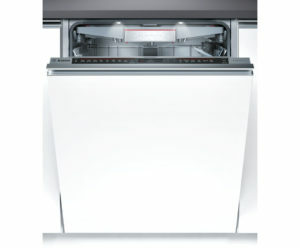 This Bosch integrated dishwasher is also remarkable for its ease of use. This machine has a touch button control system at the top of the door and it has a TFT display for the info screen. In addition to that, it has the info light with the countdown timer that gets projected down onto the floor. For loading the machine up, this machine has a 13 place setting capacity, and it has some of the most versatile racking solutions that you will find. The top basket is height adjustable to three stages, it has the third level cutlery drawer, both baskets have folding tines, and there are special foldaway racks for things like glasses and long utensils. While the Bosch Serie 8 SMV87TD00G is a bit expensive, it is a well-made appliance that offers the user good performance and a great selection of features and programs. This Bosch dishwasher can fit up to 14 place settings, the interior offers a lot of options and it is exceptionally easy to use. 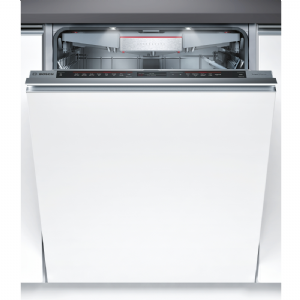 For cleaning performance, you won’t find many integrated dishwashers that perform better than the SMV87TD00G. You have a total of 7 programs, including the three sensor wash options, and it has settings for eco, quick wash, pre-rinse and super. Beyond that, you have features like hygiene for a sanitizing wash, intensive zone, half load and it has the VarioSpeed time saver. If you are looking for a user-friendly appliance, this model also delivers in that regard. It has the touch controls and a TFT display at the top of the door, and it has the time light with a countdown timer that projects onto the floor. This machine also has a good number of racking options with the third level cutlery tray, height adjustable top basket and the baskets have a number of different folding and adjustable racks. Though it is still a fairly expensive machine, when you consider the performance and the range of features, the Bosch Serie 6 SMV69M01GB is a good value. The user can fit up to 13 place settings per load in this model, it has features like sensor washing and it offers a good level of interior versatility. For cleaning performance, users will not be disappointed by the results that they get from the SMV69M01GB from Bosch. It has a single sensor wash setting for your standard program, plus it has programs from eco, intensive, delicate, pre-rinse and quick wash. In addition that, you have the half load feature, intensive zone, extra dry and VarioSpeed. This model also does well for its ease of use. It has a simple control panel with push button controls and an LED display. In addition to that, it has the time light, so you do get the countdown timer that you can read from the floor. The racks on this machine are also designed well and they do offer the user a good number of options. It has the height-adjustable top basket, the third level cutlery tray and you also have some good options for folding racks and tines. 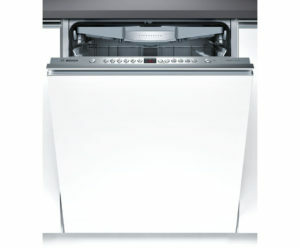 With the Bosch Serie 6 SMV53L00GB, you have a quality dishwasher that comes at a reasonable price. This machine comes ready to wash up to 12 place settings in a single load, it has all of the programs and features that you could need and it is very easy to use. For washing, this Serie 6 machine provides the user with 5 program options and it has optional features like a half load and the VarioSpeed time saver. The program selection includes one sensor wash setting as your regular wash, it has a quick wash and it has settings for pre-rinse, eco and intensive. The SMV53L00GB also has versatile racks that make the machine easy to load and the controls are very simple. On the top panel of the door, you can find the pushbutton controls and an LED display screen, and while this integrated dishwasher does not have the time light, it does have the red info light to let the user known when the machine is in operation. For racking, this is not the best Bosch dishwasher out there, but it is still pretty good. It has the top basket that can be adjusted to three positions, a removable cutlery basket, folding tines and it has some racks for large utensils. If you want a machine that is a little more affordable while still offering a good build quality and reliable performance, then the Bosch Serie 4 SMV50C10GB is worth consideration. As a Serie 4 machine, it is not one of the most advanced models that they offer, but it comes ready to provide good cleaning capabilities and it is easy to use. It does not have the same versatile range of features and functions that you would get with the more expensive models from Bosch, but the SMV50C10GB has all of the basic features that the average home will need. The list of 5 wash settings include normal, intensive, eco, quick wash and pre-rinse, plus the machine does have the VarioSpeed time saving feature. The SMV50C10GB from Bosch can fit 12 place settings per load, and while the interior is not quite as versatile as many of the other Bosch dishwashers, it is well laid out and it does have all of the basic adjustable racking features. You have some folding racks in the bottom basket, the top basket is height adjustable, it has a cutlery basket and it has some racks on the top for large utensils. Additionally, it does have the info light that tells the user when then machine is still in operation.